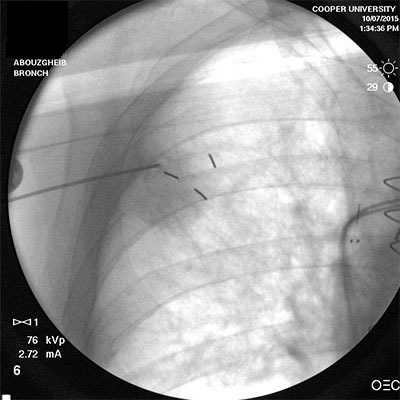 The patient was admitted to an outside hospital for dyspnea, emphysema and a 2cm lung nodule located in the RUL. 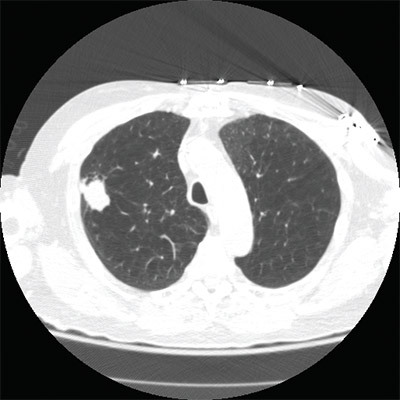 A follow-up PET scan revealed the nodule was hypermetabolic and the patient was sent for a CT-guided lung biopsy. The procedure resulted in a pneumothorax requiring intervention and a three day hospital admission. The results of the biopsy were nondiagnostic. Patient was discussed in the hospital’s multidisciplinary tumor board. He was deemed a poor surgical candidate, and the decision was made to treat him with CyberKnife®. The patient was then referred for a Navigated Bronchoscopy and fiducial marker placement in preparation for CyberKnife®. A Navigated Bronchoscopy was performed using Always-On Tip Tracked® forceps, brush, and 19ga needle. 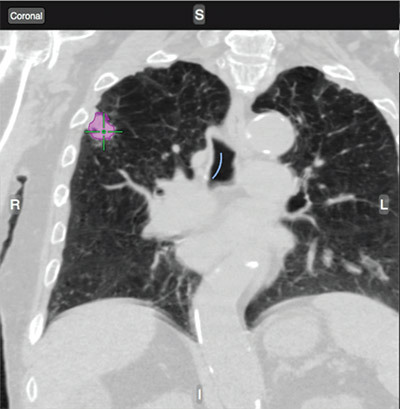 Accuracy was verified, the RUL nodule was accessed endobronchially, and biopsies were taken. Fiducial markers were loaded and deployed in adjacent tissue using the navigated needle and brush. The procedure transitioned to a navigated TTNA, SPiN Perc™, using a 19ga x 105mm percutaneous Always-On Tip Tracked® needle. Three core samples were obtained during the SPiN Perc™ procedure and additional fiducial markers were placed. The total procedure time was 25 minutes with Fluoroscopy confirming fiducial placement and no complications.